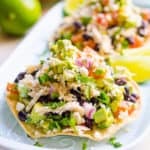 How to make healthy Chicken Tostadas and Homemade Tostada Shells in 20 minutes. SO EASY and GOOD! To make tostada shells, line large baking sheet with silicone mat and arrange tortillas in a single layer. Spray with cooking spray and sprinkle with salt on both sides. Bake at 400 degrees for 6 minutes per each side. While tostadas are baking, make easy guacamole salsa by combining tomato, avocado, red onion, cilantro, cumin, chili powder, salt and lime juice. Get other ingredients ready. To assemble tostadas, top each shell with guacamole, beans, chicken and cheese. Store-bought tostadas shells are full of artificial colours and preservatives. I prefer to make my own but you can use pre-made. Adjust salt in guacamole to taste depending on whether you use store-bought tostada shells, salted canned beans and store-bought or homemade chicken.